I didn't realize that I hadn't posted since right after my surgery! That is 10 weeks ago now and as of Tuesday I am done with crutches and walking on my own. It was a long 10 weeks though! At 2 weeks I went back to the doctor and got the huge splint off. The nurse who cleaned up my incision commented that the doctor's notes from the surgery described me as 'a relatively healthy female who is quite stoic' which I thought was funny at first but I realized that in doctor-speak it basically means I won't admit that I have pain. Which isn't true. Anyway, the doc was pleased with how things looked and I got an ace bandage wrap and a fancy boot with orders for no weight bearing for 4 more weeks when I would see him again. I also had to wait a couple more days before I could get my foot wet and I had to wear the boot anytime I was up and about and at night. When I was laying around I was allowed to take off the boot and ace bandage and move my ankle. I was finally able to sleep in a real bed again too. I went back to work on my regular schedule and was able to drive thanks to my daughter and SIL trading cars with me. I got the old minivan back and they got my Prius so I could load my scooter up behind the driver's seat. It was so nice to start being independent again, at least a little. When I went back to the doctor, he said I could start putting 50% of my weight on my foot for 2 weeks and then up it to 75% for another two weeks and as I said before, I am now totally off the crutches. I have a bit of a limp as I work to get the swelling down and stretch all those muscles that had a 10 week vacation and it does hurt some, but it isn't the ankle that hurts, it is my calf and various muscles in my foot. My family was great during my recuperation. Yes, even my son! He made my mocha most mornings and brought me food and other items I couldn't carry using crutches or scooter. My daughter worked at getting the garden prepared and planted and also planted my geranium starts in pots on the deck and kept everything watered. She has also been picking the strawberries the last week or so and there are a lot of strawberries again this year! Hubby and SIL were busy with work but helped me and picked up the slack where they could. Friends and co-workers were great as well! A lot has been going on in the last weeks. First and foremost, we are waiting for our newest grandchild. Our daughter, who lives right here is having her first baby! It is due in the next week or so. She has been driving school bus all school year but decided to take maternity leave for the last two weeks of school. It was starting to get uncomfortable driving bus for longer periods. I have gone to three baby showers for them and it has been quite fun getting to know her work friends and church friends and SIL's family a bit more. I have been missing Lucy and started looking for a new puppy while I recuperated. I knew I couldn't get one until I was more mobile so I could work on the house training but I was looking. I discovered that finding a miniature poodle in our area was not so easy. There are lots of them in other parts of the country but not up here in the NW corner. I had almost given up and starting looking at some other options when I found some about 2 1/2 hours away. I called one Sunday and Hubby and I jumped in the car and headed out. We fell in love as soon as we saw the 8 week old red female and we were able to bring her home that day. Here are a few pictures, okay, a bunch of pictures. As I said we have fallen in love! Here is Ginger with her daddy shortly after she came home. 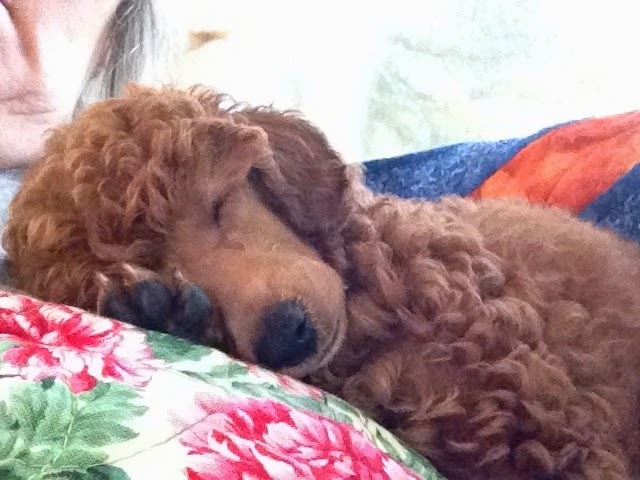 Taking a nap a few days after she came home. So tired she was sleeping sitting up. As you can see, she spent a lot of time sleeping those first couple of weeks. 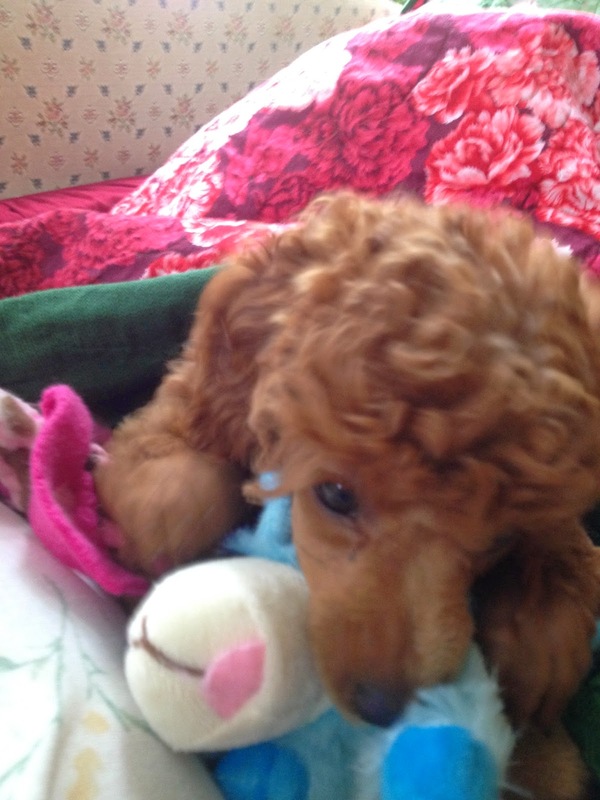 Chewing on one of her favorite toys, Lambchop. 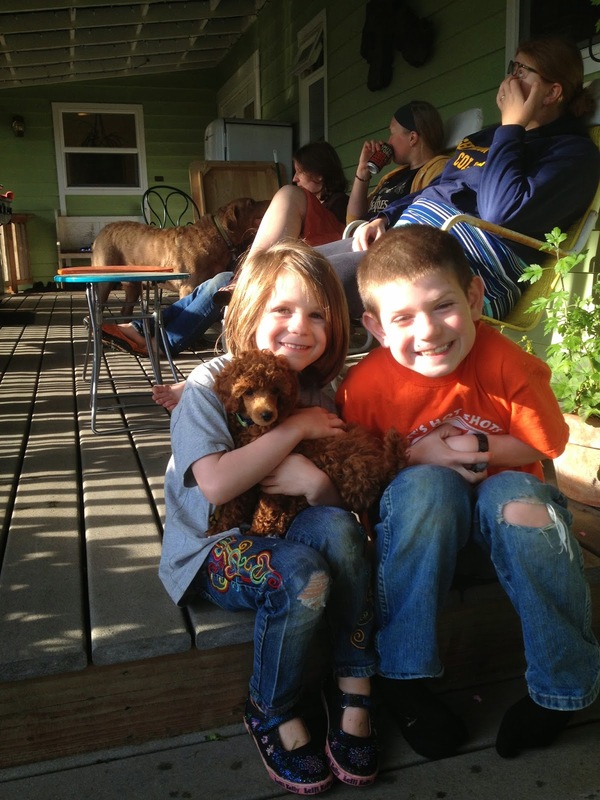 The grandkids with the new puppy. They think we made a good choice. 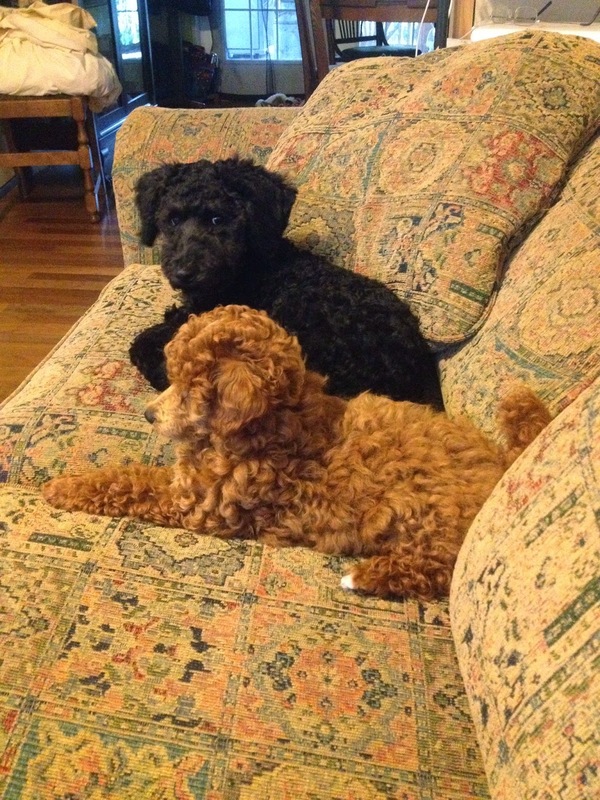 A few moments of peace with her 'cousin', Kinzie, a labradoodle puppy a few weeks older. Cuddling with my oldest daughter. Ginger is a great puppy and has definitely bonded well with me but is very social and loves pretty much everyone. She has had opportunities to meet several other dogs and cats. First there was Mandu, our son's Maltese dog, followed by our resident cats. She met my boss' dogs, a Weimaraner and a Springer Spaniel and then our daughter arrived with her 90+ pound Chesapeake Bay Retriever. Ginger was a little scared at first but then decided that big dog was very cool. She wanted to play but whenever Sophia stood up she changed her mind! Just a couple days after Sophia left, Ginger met my sister's new puppy, Kinzie. 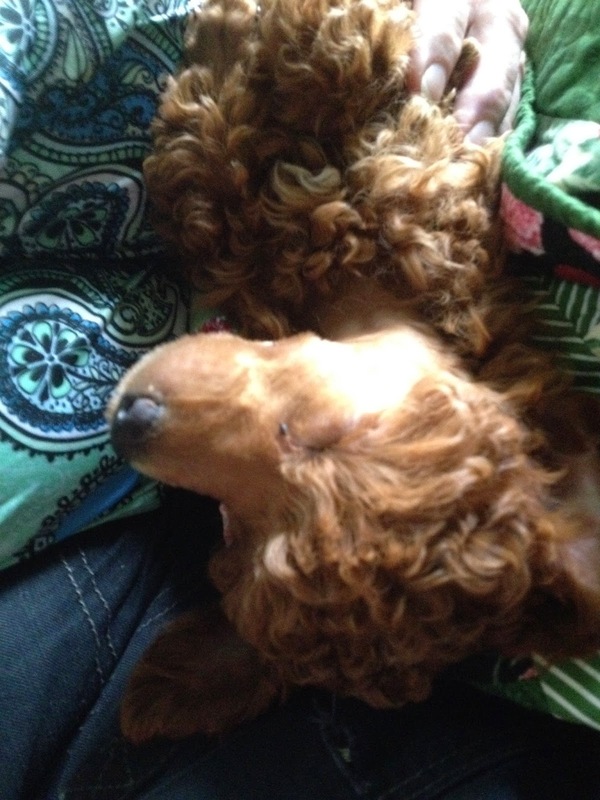 She is a labradoodle 3-4 weeks older than Ginger and at least twice her size. It started out a little rocky but by the end of the visit they were well on the road to being friends. Well, that brings you all up to date on me and the family. I hope I can get another post done tomorrow sharing the quilts that were exchanged in our Craft Night Group a week or so ago. Yay! A new baby almost! Oh, and yay! You can walk!